This weeks setting of the week is a double header but they are really simple but so commonly used that they really have to be mentioned. 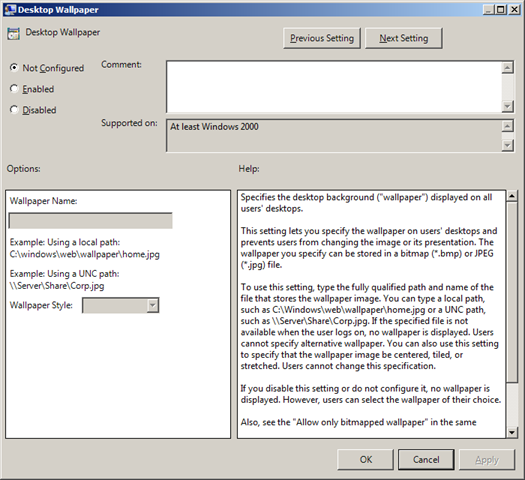 The first setting is found under User Configuration > Policies > Administrative Templates > Control Panel > Personalization > Prevent changing desktop background. 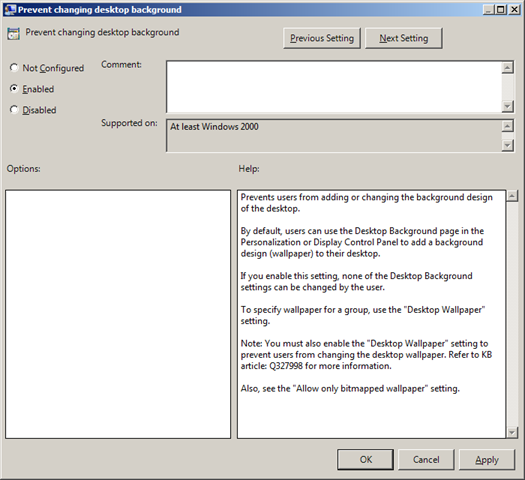 As the name suggest this setting prevents users from changing the background image via the Display Setting control panel applications however it does not prevent users from right clicking on an image and setting it as a background image. 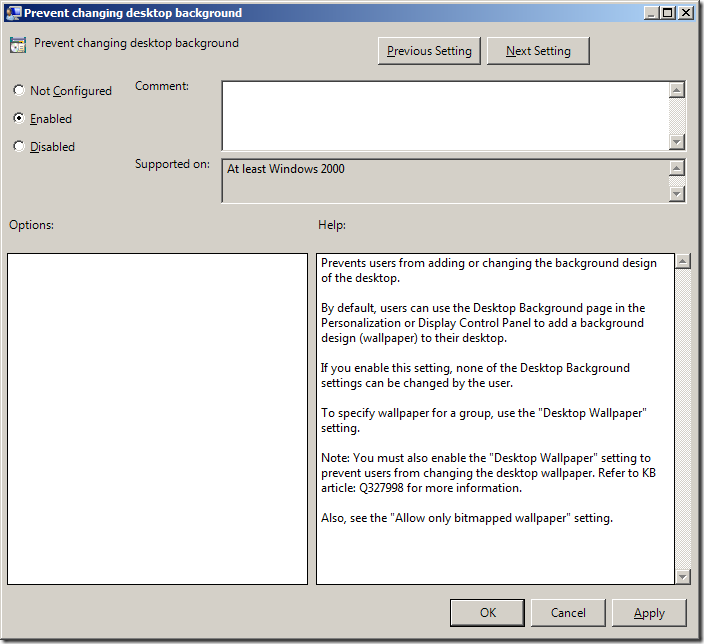 If you really want to stop users from changing the background image then you also need to configure the “Desktop Wallpaper” setting to specify a background image which can be found under User Configuration > Policies > Administrative Templates > Desktop > Desktop (yes Desktop is there twice). These setting should be configured for anyone want to implement a standard background desktop image of their SOE computers. However be warned if you are going to implement this setting then expect to cop a lot of flack from your users complaining they cant set their background image to their favourite family photo or even worse their cat. Yeah, well. Users right click| Set as desktop wallpaper, or do so from within a menu of some image viewer/and/or/editor. Re to: However be warned if you are going to implement this setting then expect to cop a lot of flack from your users complaining they cant set their background image to their favourite family photo or even worse their cat. Gautam: Another route(one which is generally a lil more acceptable by end users) is to push down a theme which has multiple wallpapers set in it (multiple Company logo perhaps). A ‘lil better than a static wallpaper each day of the week. This is for windows7 only though.